illuminated, a night diapered with stars and trailing comets. To be of night so frighteningly silent, so utterly incomprehensible and eloquent at the same time. Never more to speak or to listen or to think. The first iteration of Psycho Subtropics, Amusements a la Psycho-Sub-Tropics, was presented in 2009 at Tape Projects, Melbourne. It was pulled together in somewhat frantic style by Sally Golding in the immediate aftermath of our expanded cinema collaboration, Abject Leader’s work as part of the Synesthesia series at the Australian Centre for the Moving Image. An entourage of fellow travellers had joined us from Brisbane for the ACMI show to help out and needed something to do while still lurking around for a few more days. I escaped back to Brisbane early on the morning of the show and missed the whole thing. As a result, all I can do is pore over the residue and recall what others spoke about at the time. The above poster is classic Golding, articulating her enduring obsessions with madness, blindness, control, and human experiment – concerns that heavily shaped our activities through the first few years of OtherFilm. The ‘tropical’ description of her own experimental film work is telling. Sally’s job at the time, audio-visual conservator, was to clean mould, grime and residue from innumerable containers of celluloid film stored in the State Library of Queensland’s archive. The ‘tropics’ literally embed themselves in the material substrate of film in Queensland: a disintegrating force, a destructive wet heat that attaches itself to photographic images, causing them to decompose and rot. Amusements a la Psycho-Sub-Tropics embraced this sense of material decay, recognising it as an underlying aesthetic principle of much Brisbane work at the time. We all found beauty in the fragility of materials partially or wholly destroyed by Brisbane’s relentless, unforgiving tropicality. We extended the entropic material metaphor to include the psyche – aspects of thinking, memory, and speech – rendered ‘troppo’ (the term used by Australian troops in tropical regions during WWII to describe the madness of afflicted soldiers stationed near the Equator), human faculty in erratic decline. Chloe Cogle’s ‘senile’ narrations for slideshows featuring eroded tombstones in harsh light, This Imperial Can’s array of permanently busted noise ephemera. Both of these works revel in a composted amusement rooted in the strange fecundity of simultaneously sunny and bleak Brisbane. A year later OtherFilm were invited by Melbourne-based curator Jared Davis to contribute to his series Always Moving at Gertrude Contemporary. Danni Zuvela and I came together with Sally to try to develop a more considered proposition about the Brisbane underground scene across art, film, and music at that time. Presenting Psycho Subtropics at Gertrude, a prominent contemporary art space, encouraged us to think more critically about Brisbane as a psycho-stage for specific ideas and approaches. We wanted to dig deeper into a parochial questioning of Brisbane’s style in order to hold a mirror up to the findings, and bounce them against a Melbourne audience. We billed the program as ‘two evenings of unfolding nihilistic profundity’, ‘celebrating the decline of traditional values’, and ‘straddling altered interstates between decorum and delirium’. This reflected a common thread between all the artists (or ‘agents of aberrance’) of ‘void-oriented’ partying, a sense that the spaces opened up by a certain Queensland-bred nihilism were now ripe for experimentation. Psycho Subtropics resident philosopher Gerald Keaney memorably described this DIY tendency as a “weapon against the urban boredom” of “revolting cities… Brisbane, for instance, is a joyless workhouse made of glass tile partitions, touched up in peach pink and decorated by the occasional sad palm tree.” The ‘sad palm tree’ image points directly at the amalgam of tropicality and bleakness found in Laura Hill’s self-sabotaging new-wavisms, Sky Needle’s carnavalesque junkiness, and Sarah Byrne’s multichannel karaoke cacophony. These works ‘acted out’ in an atmosphere of unspecified decline. This edition of Psycho Subtropics provided the first Melbourne ‘outing’ for artists Alex Cuffe, Sarah Byrne, Laura Hill (performing as Scraps), Andrew McLellan (performing as Cured Pink), and the band Sky Needle – all of whom have gone on to exhibit and perform regularly in the city. 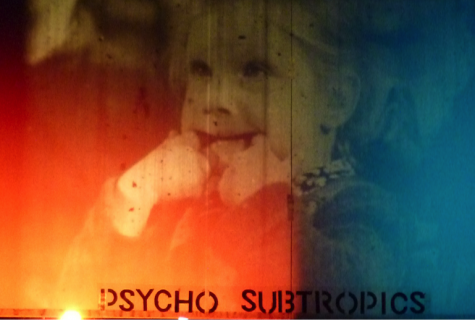 The third Psycho Subtropics, held at Serial Space in Sydney 2012, attempted to survey the overlap between underground music and contemporary art in Brisbane over a four-day exhibition program featuring concerts and screenings. Half the artists in Brisbane play in bands or make music, and most of the active musicians in the underground scene maintain an art practice. In addition, they all make films or videos. Beyond evidencing and showcasing this interdisciplinary overlap, we wanted the 2012 group to self-generate some collective and collaborative approaches and propositions over the course of a few days ‘workshopping’ leading into the show. Serial Space generously provided a ‘home from home’, a Bris-friendly ‘refuge’ for this purpose. The show happened in the wake of Campbell Newman’s shockingly one-sided Queensland election conquest and our thoughts were dominated by general pessimism or trepidation towards the ‘cultural vandalism’ that was widely predicted to ensue. 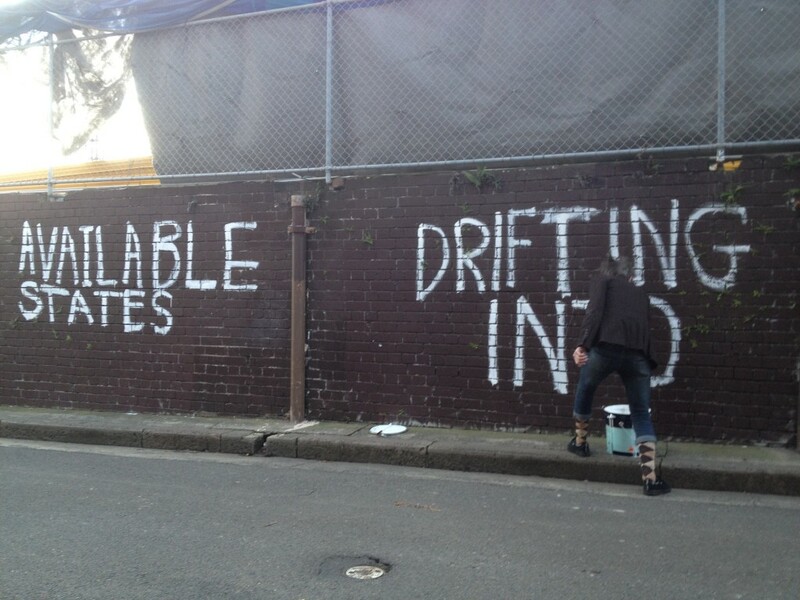 Gerald Keaney forwarded a strategy for ‘resisting’ state power through a constant autonomous drift into whatever ‘available states’ remained – playing on the dual meaning of state as both a ‘governed entity’ and a ‘psychological outlook’ in a series of socially engaged performance works. Playing on, yet also underlining, the cultural traditions of agit-prop, Keaney’s work bore the classic Brisbane hallmark of simultaneous ironising and earnest alterity.